The Penguins defensive situation looks much different just 6 games into the start of the season than it did at the beginning of training camp. Tomas Vokoun's injury and some creative accounting allowed Ray Shero to keep all of his defensive players in the system when it looked certain that Matt Niskanen would be playing elsewhere. Despite being in the early stages of the season the lineup on the blueline is far from set as Kris Letang will need to work himself back into the mix and a midseason trade remains a very real possibility. Even after only a handful of games we've learned a lot more about the defensemen than we did during the offseason, and I try to breakdown what will happen with them not only for this year but the years to come as well. Season Outlook: An injury at the end of training camp prevented Letang from being in the lineup opening night, but he's guaranteed to regain his place in the lineup once he returns to full health. Letang is in the last year of his current contract and his cap hit will jump to $7.25 million for the next 8 seasons after this one. While there was some debate about giving that contract to Letang with the salary cap situation, he's a young defenseman entering his prime years who managed to earn a Norris Trophy nomination last year despite missing 13 of 48 games. He's one of the best skating defensemen in the league with very good offensive skills. He's had lapses in his own zone, but has shown himself to be a capable defender at times and the addition of Jacques Martin to the coaching staff should help with his consistency in the defensive zone. Letang will be logging huge chunks of minutes very soon on both the power play and the penalty kill and add an infusion of talent to a unit that has acquitted itself well during the young season. Future Outlook: Kris Letang will be a Pittsburgh Penguin for many years to come; he's locked up in a maximum length long term deal and has a modified NTC. He's the building block around which the defensive unit will be constructed for many years to come. Season Outlook: Though the season is young, Paul Martin is continuing to show that the 2011-12 season that made him the scapegoat of the entire fanbase was nothing more than an aberration. It appears likely that Dan Bylsma will continue to play Martin around 25 minutes a night as he did last season with a big role in the penalty killing as likely 2nd team power play duty once Letang and James Neal return to the lineup. Martin continues to pair with Brooks Orpik to form the Penguins top shutdown defensive pairing and he should continue to draw the opposing team's hardest competition. Future Outlook: Once viewed as a likely buyout candidate as the lockout ended, there appears to be little chance that Paul Martin doesn't finish out his contract with the Penguins. Martin will have turned 34 not long before his contract expires, but he should be someone Ray Shero attempts to re-sign as early as this upcoming offseason. Martin's game doesn't rely on exceptional athleticism but more on smart positional play, and because of this it's much more likely that his game doesn't suffer a dramatic fall off as he hits his mid-30s. Shero would be able to sign Martin the season before he would be constricted by the over 35 rules of the salary cap, and it wouldn't be a surprise if he signs a contract that allows him to retire as a member of the Pittsburgh Penguins. Season Outlook: Brooks Orpik has been healthy to start the season, and given that injuries have limited him to less than 100% in years past being able to start off the year without any nagging injuries only increases the likelihood that Orpik won't wear down before the playoffs begin. He forms a very effective shutdown pair with Paul Martin in the role of the stay at home defenseman, and with 23 hits and 19 blocks to start the year the physicality in his game is in full force. Orpik might be only 33, but he plays a style that makes a player old beyond his years, and Bylsma should be careful to be proactive with any minor injury that has the potential to become a lingering issue. He remains a vital member of the blueline, and being able to have Orpik on top of his game will make a big difference in the defensive zone. Future Outlook: Brooks Orpik is the longest tenured Pittsburgh Penguin and has played his entire career in Black and Vegas Gold since being drafted out of Boston College in 2000. He's been a team leader, wearing the "A" on his jersey for several seasons, and is one of the most respected players in the dressing room. 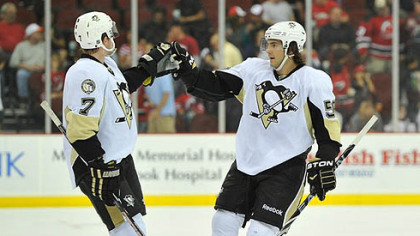 He will be extremely difficult to replace, but it's a tough decision that Shero needs to make this next offseason. With the organizational depth on defense, the wear and tear on Orpik's body, and the savings an entry level contract would provide against the cap it's time to start gearing towards the future and wish Orpik the best of luck with another team. Season Outlook: Ray Shero finally managed to replace Rob Scuderi this offseason, and it's only fitting that he managed to do so by bringing Scuderi back into the fold. The Penguins have sorely missed his steadying presence on the blue line, and he should make the ideal defensive partner for Kris Letang. Scuderi spent time partnered with both Drew Doughty and Slava Voynov in Los Angeles and knows the responsibilities that come with being paired with an offensive defenseman. Bringing back Scuderi allows the Penguins to have two very strong pairings in their top 4 and will go a long ways to shoring up some of the problems that have arisen the past few seasons in their own end. Future Outlook: Scuderi signed a 4 year deal this past offseason and will be 38 after that deal expires. It's unlikely his time back in Pittsburgh will extend past that, but he should give the Penguins a solid top 4 presence for at least the next couple of seasons and help serve as a bridge to the next generation of Pens defensemen as they develop into full time NHL players. Season Outlook: The smart money during the offseason was on Matt Niskanen being traded due to salary cap concerns, but not only has Tomas Vokoun's injury and LTIR designation allowed Pittsburgh to get under the salary cap without needing to shed salary, but Kris Letang's injury to start the season has allowed Niskanen to play a larger role for the team, and to thrive while doing so as well. Niskanen has paired with Rob Scuderi at the start of the season and leads the team with a +8 rating and leads the defensemen with 5 points. Depending on how the salary cap situation works out for the rest of the year, Niskanen has either proven his worth as an above average 3rd pair defenseman or helped to drive up his value around the league. It seems that Niskanen has always managed to up his game when thrust into a position of greater responsibility, and at just 26 years of age could prove to be a valuable top 4 defenseman on a team with fewer options. Future Outlook: The fact that Matt Niskanen is still in Pittsburgh in enough proof that no matter how certain something might seem, it's still just a projection until it actually happens. There's a very real chance that Niskanen isn't with the team when his contract expires this offseason, but either way it doesn't appear likely that Shero will attempt to re-sign him. Niskanen will cost too much to sign to be a 3rd pairing defenseman, especially when one of the young prospects on their entry level contract can be a much cheaper option in his place. Season Outlook: Robert Bortuzzo still hasn't seen a ton of ice time early in the season, and he's faced the easiest competition by far out of all the Penguins defensemen (-1.893 relative QoC), but as a 24 year old defenseman Bortuzzo is progressing nicely into his role as the 6th defenseman. He has looked better in his own zone and more confident on the ice while playing with a 19 year old rookie, and it speaks volumes to his progression that Bylsma is playing him ahead of Deryk Engelland. While Bortuzzo is unlikely to progress past a 3rd pairing NHL defenseman, he is showing himself to be a reliable option with a great cap hit and should continue to get the majority of games played if splitting the 6th defenseman role with Engelland. Future Outlook: Out of all the bottom of the lineup options, Bortuzzo's spot on the team is probably the most secure, whether he's the 6th or 7th defensemen. He's a restricted free agent when his contract expires in 2015 and should once again be a cheap option that Shero has little difficulty deciding to re-sign. Season Outlook: While reports from people who had seen him play suggested that Maata could be NHL ready, the fact that he managed to make the opening day NHL roster with the list of defensemen in the system was easily the biggest surprise of training camp, and it's an impressive accomplishment for the 19 year old defensemen regardless of Kris Letang's injury. Not only did he earn a spot on the team, but he hasn't looked out of place in the NHL either and appears very composed for such a young defenseman. He's been a bit sheltered in his usage, including starting 61.1% of his shifts in the offensive zone, but he's shown that he might not have much left to learn in junior hockey and could really improve his game by playing every night in the NHL. While sending him back to juniors might be the easiest option, Maata does have a chance to stay with Pittsburgh as Shero will have several options if he decides to go that route. Maata can play 9 games before this season counts as the first year of his entry level contract, so it's likely that his future this season will be decided before he appears in his tenth game. However, being a healthy scratch doesn't would allow Maata to stay with the Penguins longer, and if that happens and Letang is in the lineup it could signal that Shero is trying to move a defenseman so he can keep Maata in the NHL for the entire season. Future Outlook: It seems safe to say that Olli Maata has played himself into being untouchable in trade talks, and he should be one of several young defensemen who make the NHL roster within the next couple of seasons. He has the potential to develop into a top 4 defenseman and looks to be a big part of the future, regardless if he spends the rest of the year with the Penguins or in London. Season Outlook: Deryk Engelland has been surpassed by Robert Bortuzzo so far this season and has fallen to 7th on the NHL depth chart. He has dressed for 2 games so far and has seen very little ice time, and it appears unlikely that he's in line for anything more than a few spot starts going forward. While Engelland is the only player on the roster who could naturally fill an enforcer role, his play on the ice doesn't justify him getting enough games played to justify hanging around for that purpose as there are others who can drop the gloves if need be. Although it's a very small sample size, Engelland has a -16.49 corsi in two games along with a relative corsi of - 32.8. It's easy to see from watching him play that Engelland cannot help drive possession and is the worst of the 7 options currently in Pittsburgh. Based off talent alone he would be waived once Kris Letang returns to the lineup, although it's more likely that Olli Maata is sent back to juniors. Future Outlook: Engelland's contract is up at the end of this season and he becomes an unrestricted free agent. Outside of fighting he offers nothing that cannot be replaced with players already in the system and shouldn't be a priority once free agency starts. It's always possible that he's brought back as a cheap option in his current role, but the defense corps would be better off without him. Season Outlook: At the end of the 2013 season, Dan Bylsma publicly stated that he viewed Simon Despres as a top 4 option for this year and someone who would see more ice time. However, that was before the team signed Rob Scuderi as a free agent and before Despres again showed up to training camp not in top shape. While disappointing, it's worth remembering that Despres is a 22 year old defenseman, and while his conditioning was suspect he did play well in preseason games without that appearing to be an issue. Despres has the size, skating, and offensive talent to be a solid NHL defenseman, and being able to play in the AHL will allow him to get more ice time and continue learning what it takes to be a professional. Through 3 games so far this year he has 1 assist and a +6 rating for the Baby Penguins. Future Outlook: Depending on the salary cap situation and how the roster shakes up, Despres could find himself in the NHL full time by the end of the year and should be first in line for a call up if an injury occurs. It has to be disappointing from a management standpoint that Despres wasn't able to stick in the NHL this season, but he should remain apart of their future plans and be back in the NHL soon. He probably doesn't have the untouchable trade status he had gained last year, but it's unlikely that he would be traded for a rental player and it would be difficult to bring back an NHL caliber player due to salary cap concerns. Despres would likely have to be traded for futures, whether picks or prospects, and given where he is in his development and what he's shown at the NHL level that doesn't appear to be a likely route for Shero to go. Whether he finishes out the year in Wilkes-Barre or Pittsburgh, Simon Despres should still have a place in the Penguins plans for future seasons.